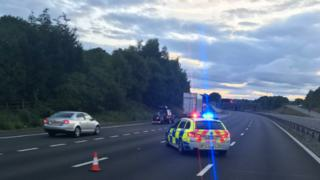 Image caption Police close off part of the M42 after a fatal crash. One person was killed when four cars and a lorry crashed on the M42 near Redditch and Bromsgrove. Three of the cars went up in flames after the smash on the southbound junction of the motorway last night. One woman was pulled from a flaming car by an off-duty paramedic who ran to her aid. A 52-year-old man from Exmouth, Devon, has been arrested on suspicion of death by dangerous driving, police say. He remains in police custody. More stories from Herefordshire and Worcestershire. The person who was killed has not yet been identified by police who are appealing for witnesses. West Midlands Ambulance Service received a 999 call to the M42, between junctions one and two, at 20.55 BST and sent two ambulances and two paramedic officers to the scene. Three of the cars were described as being "well alight" when crews arrived. The injuries of one occupant were fatal. An ambulance service spokesman said: "Unfortunately, it immediately became apparent nothing could be done to save them and they were confirmed deceased." Of another patient, the service said: "An off-duty technician, who was in traffic just behind the accident, immediately went to assist upon seeing the collision and with the help of bystanders, managed to pull a woman from one of the burning cars." The woman, said to be in her 70s, was treated for minor burns and an arm injury and taken to hospital. The spokesman added: "The quick-thinking actions of those who rescued the woman undoubtedly saved her from suffering far more significant injuries." The driver of the car - a man also believed to be in his 70s - had got out of the car and was treated for minor injuries. The male driver of another car was treated for a knee injury and taken to hospital. Four other patients, including the driver of the lorry, were assessed and discharged at the scene with minor or no injuries, the ambulance service said. A police spokesman said: "A criminal investigation has commenced, with forensic reconstruction currently taking place." The crash caused major delays on the southbound motorway.